One of the things that kept a lot of people from switching over to using Google Chrome as their default web browser was the lack of support for toolbar add-ons and extensions. After all, once you get used to something like the Google toolbar or a URL shortening add-on, it’s hard to live without that extension. The Chrome web browser was designed to be fast and have a very simple interface. Unfortunately, being “fast and simple” doesn’t always mesh that well with having extra toolbars and add-ons. Despite this, the latest stable version of Chrome will support extensions, and an official gallery including over 1500 extensions is already up and running. In the Google Chrome Extension Gallery, you can browse through the complete library of Chrome extensions either by wading through the most popular or recent additions or by searching for a specific type of extension. Here’s a sampling of some of the types of extensions available. AdBlock − With the new AdBlock extension, Google Chrome may see a sharp climb in popularity. Similar to Firefox’s AdBlock Plus, this add-on lets you block distracting advertisements on web pages. The utility has several easy customizable options so you have more control over which sites you will allow to show ads and which ones you won’t. Google Translate – Once this extension is installed, you can instantly translate an entire web page into a language that you can actually read and understand. Chromed Bird – If you’re a Twitter fan, you may want to try out the Chromed Bird extension. 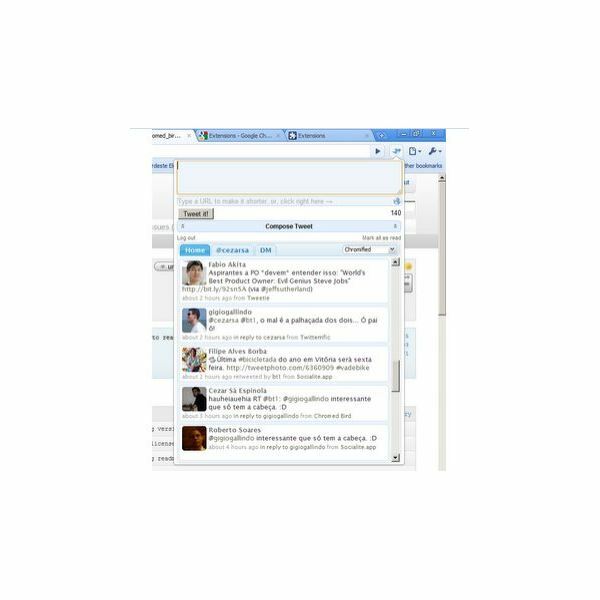 This add-on lets you follow, track and update your Twitter account from the Google Chrome toolbar. Also check out some of the other Chrome extensions for Twitter. To manage extensions in Google Chrome, simply select Extensions from the Tools menu (the icon shaped like a wrench). This will open a new tab in Chrome in which you can enable or disable extensions that are already installed, modify any available options for the extension, and get new extensions from the Chrome Extension Gallery. In addition, most extensions will add an icon to the Google Chrome toolbar – you can right-click any of these icons to access shortcuts for managing that particular extension. While these icon shortcuts for extensions can be useful, they come with a bit of a price. If you download and install several extensions, it doesn’t take long for the Google Chrome toolbar to become fairly crowded. So, instead of going extension-crazy, you may want to restrict yourself to only installing the add-ons that you think you’ll use on a regular basis. Not only will this help keep the toolbar uncluttered, but it will also keep Chrome running fast and smooth. On that same note, if you start to notice a decrease in Chrome’s performance, you should probably begin your troubleshooting by disabling extensions that you’ve recently installed and see if that corrects the problem.